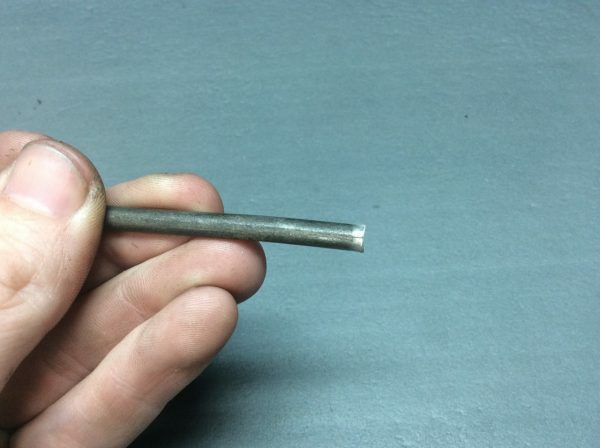 Most people think of the truss rod as the smoking gun regarding an instrument’s playability. Action too high? Tighten the truss rod. Action too low? 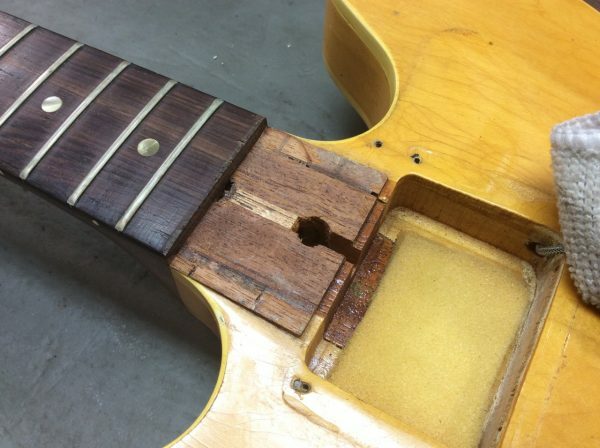 Loosen the truss rod. This kind of advice runs rampant on forums all over the internet, and it’s dead wrong. Guitar necks have an optimal relief of between .1mm (.004″) to .17mm (.007″), as measured at the 6th fret. Neck relief is only a small part of the complete setup of an instrument, and is largely only adjusted to allow for proper string oscillation. 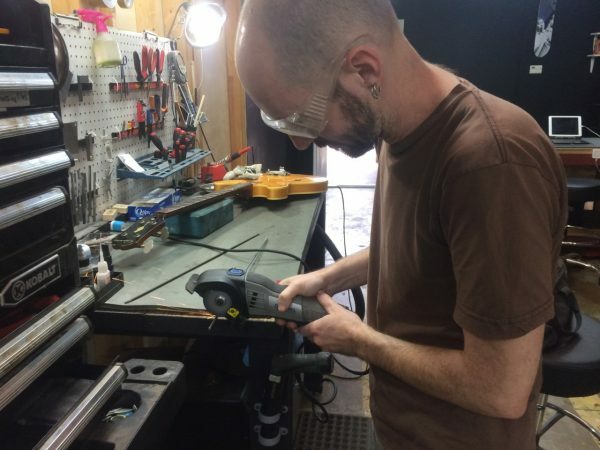 The trouble with all this bad advice being propagated on the internet is that it encourages people to get rather over zealous with their truss rod adjustments, and some of those poor souls end up breaking the truss rod. 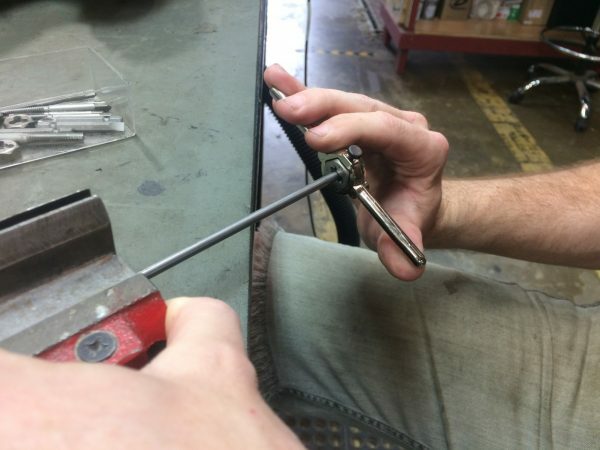 Most times when a truss rod breaks, it’s right at the truss rod nut, which is not a difficult repair for us and we fix these kind of breaks quite often. Occasionally, they break in a much more dramatic fashion, requiring replacing a broken truss rod. 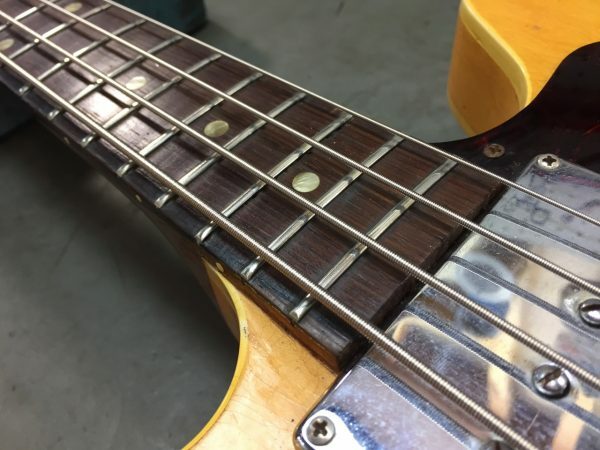 We recently received a vintage Epiphone Rivoli bass, where the truss rod was just spinning inside the neck. There was no fixing this one – it had to be removed and replaced. 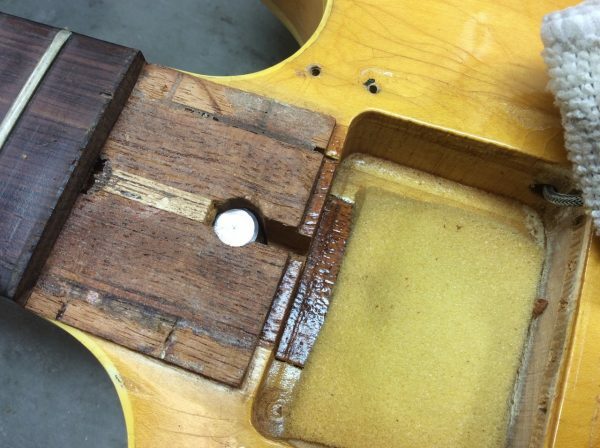 Replacing a broken truss rod can be an invasive process, and when one is dealing with a vintage instrument, great care must be taken to make the repair look as invisible as possible. On a broken single action style truss rod, it’s a good bet that it broke at the anchor deep inside the neck. 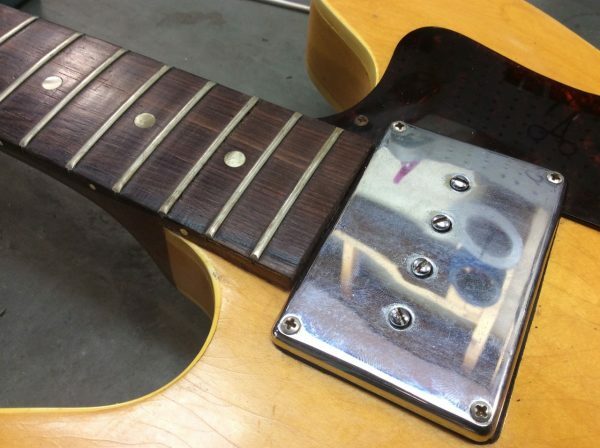 I used some powerful magnets to locate the anchor under the fretboard, which was under the 20th fret. Instead of removing the entire fretboard, I just cut a small portion of the fretboard away, by sawing through one of the fret slots. Now that I had access to the truss rod anchor, I removed it was able to tap the truss rod out through the headstock with a hammer and a long steel rod. Once enough of the rod was sticking out of the headstock, I was able to grab it and slide it out the rest of the way. Whoever had broken this truss rod must have really cranked on this thing. Not only was the rod weld broken off a the anchor, it was also bent at the end. 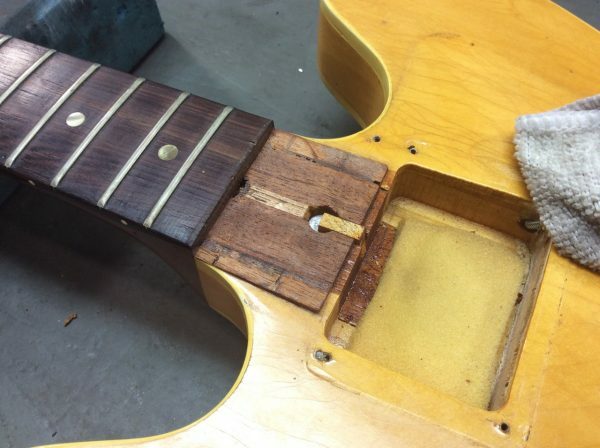 Pro-tip: if your truss rod starts to feel too tight, stop! Since the neck was heavily bowed from sitting under string tension for so long without a functioning truss rod, I did a heat press on the neck before I put in the new truss rod. This would help the wood cooperate better once the new rod was installed. To make the new truss rod, I got a section of stainless steel rod, and cut it down to the proper size, and then threaded it on both ends. Here’s a shot of the new anchor, threaded on to the rod. 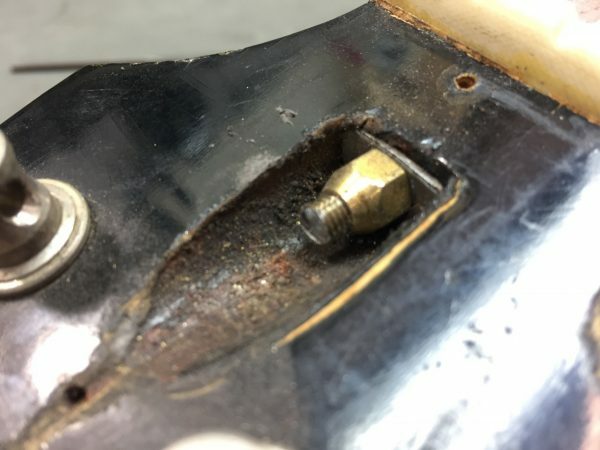 Since it’s impossible to install a welded anchor inside the new neck without removing the fretboard completely, a threaded anchor is the way to go. It’s arguably stronger, and easily fixable if some ham fisted individual Hulks out on the truss rod in the future. I took the anchor back off, and then gently hammered the rod down the length of the neck. 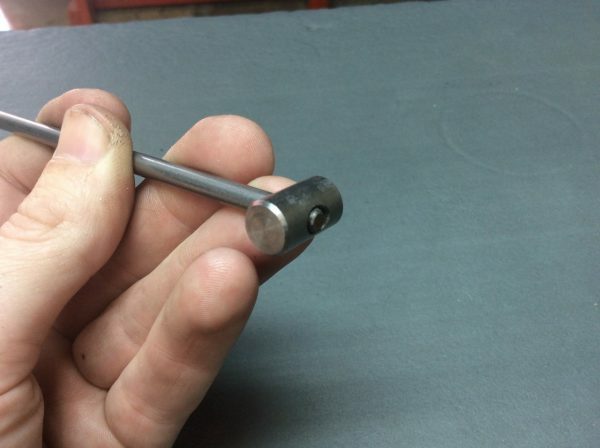 I used a chunk of wood to soften the hammer blows, so I wouldn’t ruin the threads I had just cut into the rod. I also found it helpful to apply a bit of oil to ease the process of sliding it all the way in (insert your own joke here). Before I had installed the truss rod, I cut a slot in the headstock end, so I could use a flathead screwdriver to turn the rod inside the neck and thread it into the anchor on the far end. Once the truss rod was secure in the anchor, I glued the original tenons back in place under the fretboard, and put the section of fretboard back in place and filled in the small visible cut I had made under the fret slot. Now that the anchor end of the neck was complete, I carefully sawed the excess length of truss rod, cutting off the screwdriver slot, hiding any sign that the truss rod had been replaced. That’s a wrap! 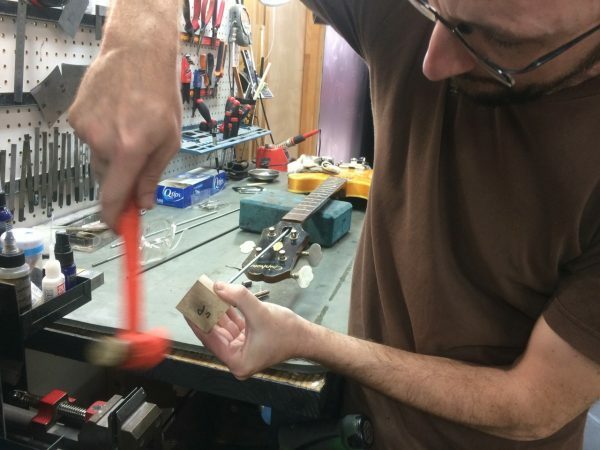 Replacing a broken truss rod like this isn’t for the meek, and should be handled with great care, especially on valuable vintage instruments like this one. 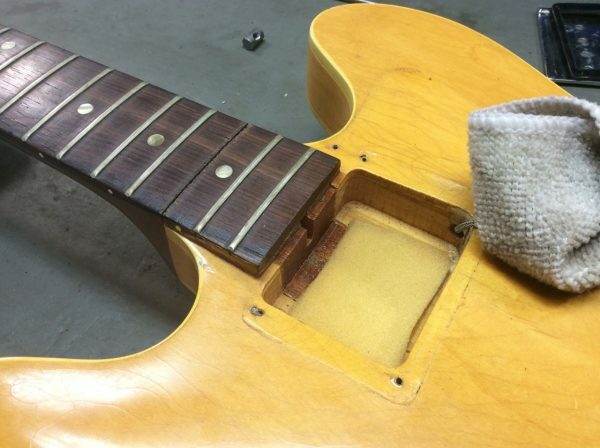 If you’ve got a guitar with a broken truss rod, give us a call – you don’t have to throw your instrument in the trash! It can be fixed! This Epiphone Rivioli was destined for the garbage bin, but now it is playing and sounding fantastic! Huzzah!